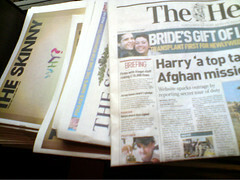 Newspaper, a photo by FireFawkes on Flickr. If you watch the BBC and STV and read one or two Scottish newspapers, such as The Scotsman or The Herald, but you don’t really read any blogs or other social media, I guess your perspective of the independence campaign is as follows: Better Together and the Westminster Government again and again point out potential problems, and Yes Scotland and the Scottish Government react to these as if they’d never considered this issue before, and the Yes campaign never seems to do anything proactive. If on the other hand you got fed up with the unionist media in the past and are now mainly getting your knowledge from pro-independence blogs, such as the Arc of Prosperity, Wings over Scotland, Bella Caledonia, Newsnet Scotland, National Collective and all the others, and if you’re additionally friends with other Yes people on Facebook and Twitter and perhaps active in your local Yes Scotland group, I bet your perspective is more like this: Yes Scotland and the wider Yes campaign are busy fleshing out the details of independence, while Better Together spread fear, uncertainty and doubt, often without any evidence whatsoever. At the same time, tens of thousands of Yes Scotland volunteers are out there talking to ordinary voters on the doorsteps. Which narrative is correct? It depends on your perspective, I guess. Because of this difference, the recent accusations against Yes Scotland of inactivity probably seem extremely reasonable to the first group, and utterly ludicrous to the second one. However, given that the first group is by far the largest one at the moment, it leaves the Yes campaign with two options: (1) Try to break through the bias of the unionist media so that normal people start realising what’s really happening, or (2) make everybody read blogs and connect to neutral and pro-independence people on Facebook and Twitter. Given that (1) is extremely hard to achieve (although of course it shouldn’t be abandoned), I think more attention should be paid to (2). Maybe the Yes campaign should for instance provide every household with a list of Scottish blogs (unionist, neutral and pro-independence). Perhaps it would also be an idea to print a small newspaper containing some of the best articles from the pro-independence blogs, and this could then be handed out to undecided voters who aren’t big users of social media.